Surprisingly yesterday I was waiting for a Nexus 8 (or whatever the name is) updated tablet, but now I’m seeing a tablet from our very own Flipkart and it’s awesome as well. 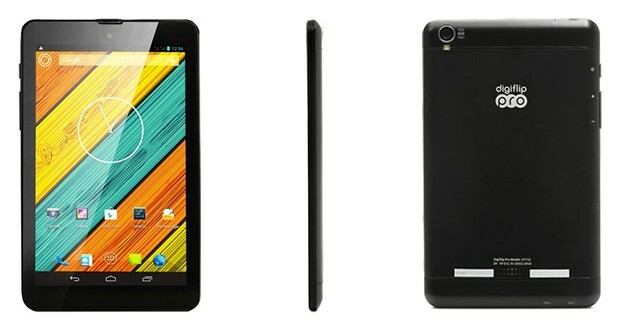 Introducing Flipkart Digiflip Pro XT 712 tablet and it is just Rs. 9999. I haven’t really got the chance to review this device personally, I’ll write a full review when I get the chance. For the time being we have mentioned the specifications for this device. It comes with a stunning quad core processor and 3k mAh battery. Though it’s not a tablet to fight with iPad Mini or Nexus 7, it is something that covers all the potential uses of a tablet. Below you can see the Flipkart Digiflip Pro XT 712 Specifications and the product is available for purchase on Flipkart. We are eagerly looking forward for hands-on review of this product, we’ll update this post or create a new post shortly. Meanwhile if you are impressed with the features and you are OK with the price tagline, then the product is always there for you on Flipkart. You’ll also get freebies like “Flat 50% Off on Book Case worth Rs.799 for Digiflip Pro Tab”, “Free Plantronics ML2 Bluetooth Headset worth Rs. 1199”, “Free eBooks worth Rs.2300”, and some other interesting deals, so it further reduces the price.